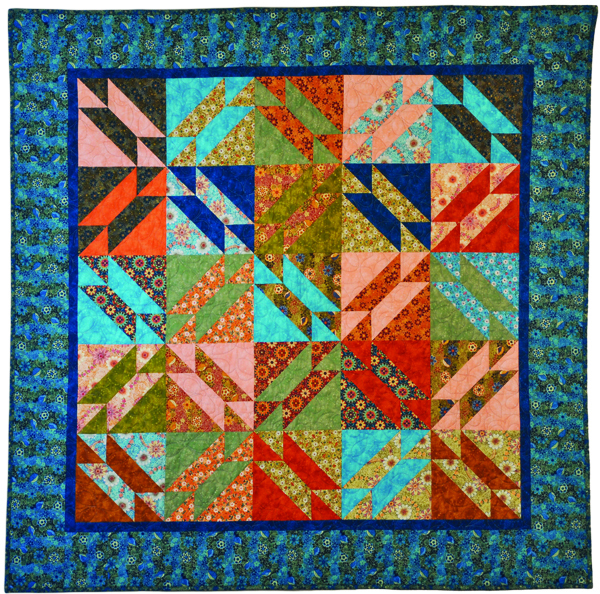 Quilt #2 from my Best of 2 Calendar Quilts 2012 pattern is Colorburst Squares. 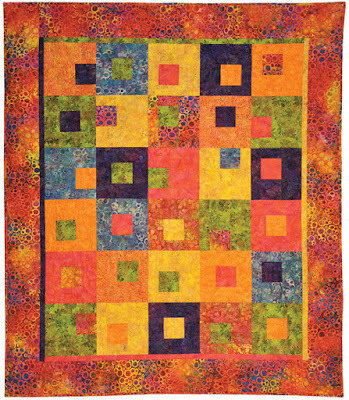 This first appeared in Quilt Magazine in 2007. It became a popular workshop. The beauty of this quilt is that it is made using ONLY 10-1/2" squares. 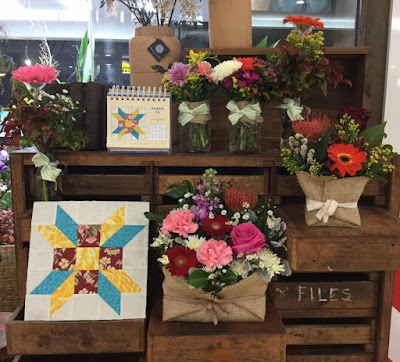 No templates, no triangles, no fussy cutting. There are three different blocks which are variations of the Cobblestone Block. 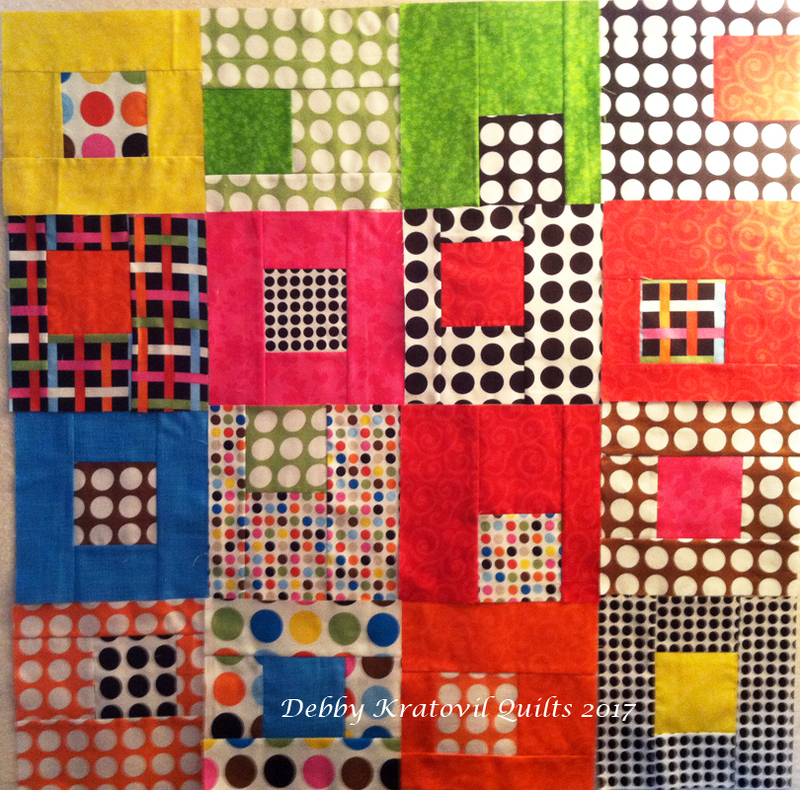 Colorburst Squares Quilt: 72" x 82"
The squares are stacked, sliced using an acrylic ruler and then sewn back together. Notice how the center square "floats" from block to block. That's because each of the three simple blocks have slightly different cutting dimensions. 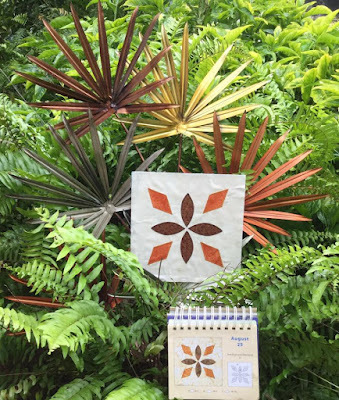 Here is the ensemble I made using the Island Batiks fabrics (so yummy)! I found these blocks the other day in a box leftover from my workshops from 2012. I think I just need to sew them together, right? But, wait! 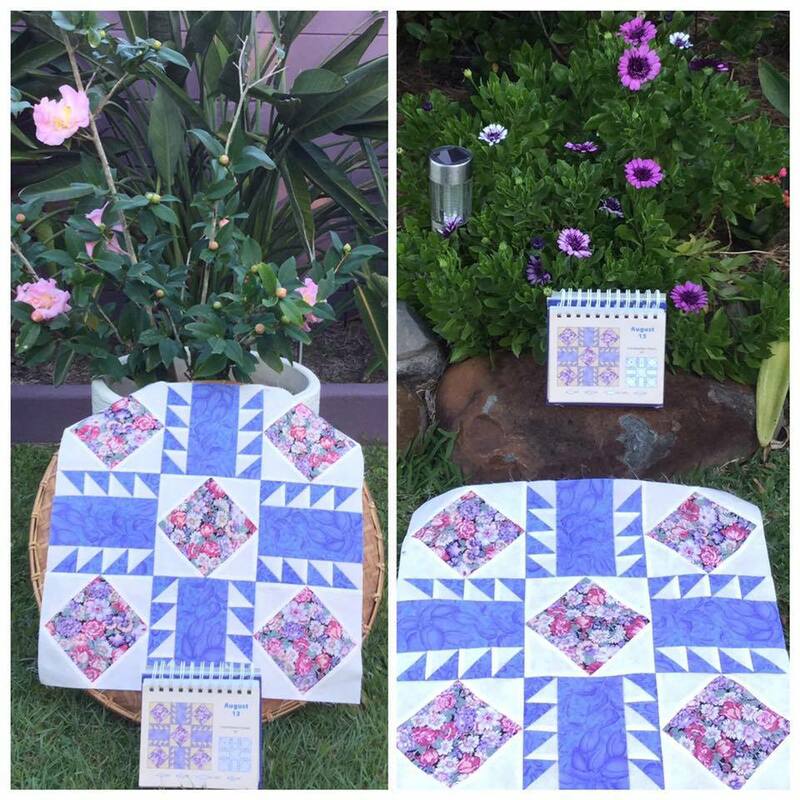 In the same box are 15 more squares ready to be cut. 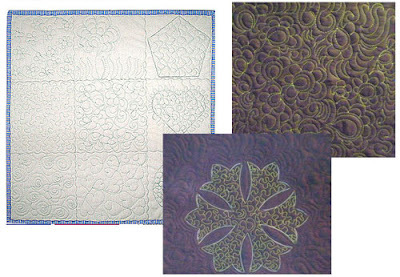 That would mean I could make another large quilt (like the batik one above). With borders it would be 66" x 76". Hmmm. Maybe this weekend? 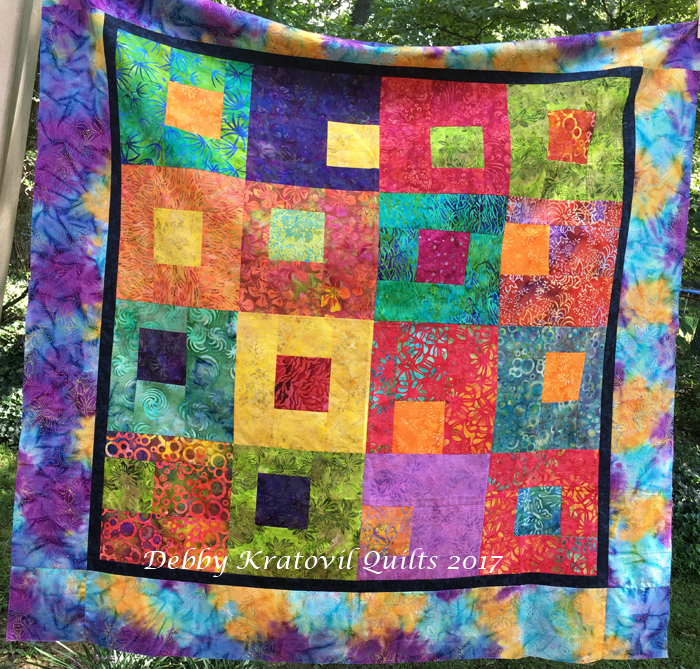 It really is a fun technique with no fabric waste. Any fabrics with good contrast will work. 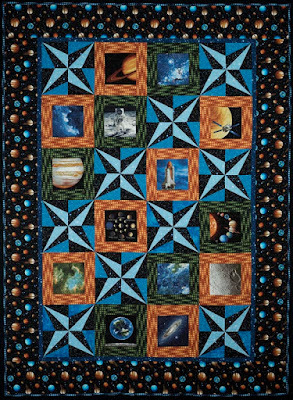 And I just found one more quilt (yes, I lose track of these things). 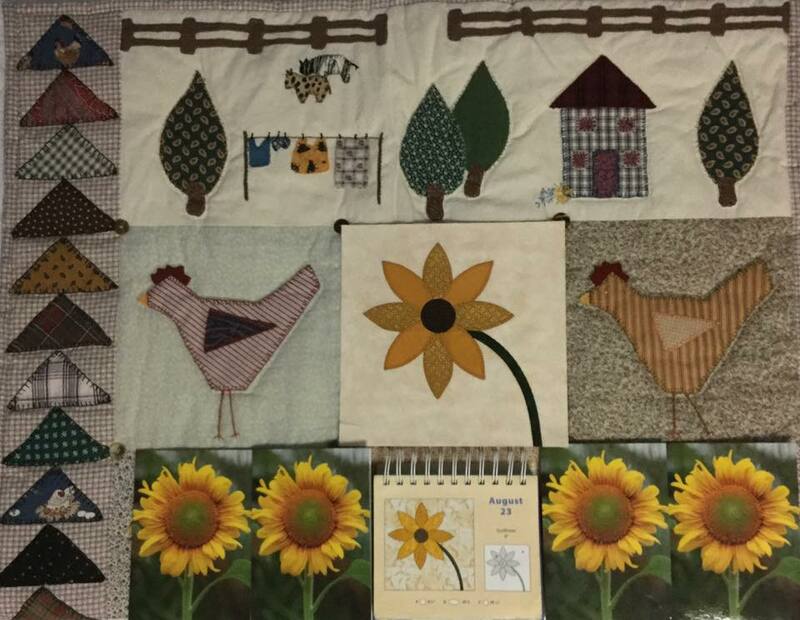 This is the 16 block quilt which was the class sample. It measures 54" x 54". Just needs to be quilted. 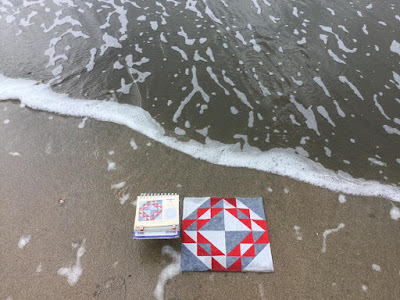 All 13 quilts are contained on one CD. You can print all files from the 92 page pdf as you need them. See you next time with Quilt #3, Hearts on Fire. Calendar Girl Quilts - 13 of Them! In case you missed it, I published 13 quilts in a wall calendar in 2012: "The Best of 2012 Calendar Quilts." I sell this on my Craftsy site and thought I would highlight each of the quilts here to show you all the wonderful and different techniques are included in this 92 page pdf. 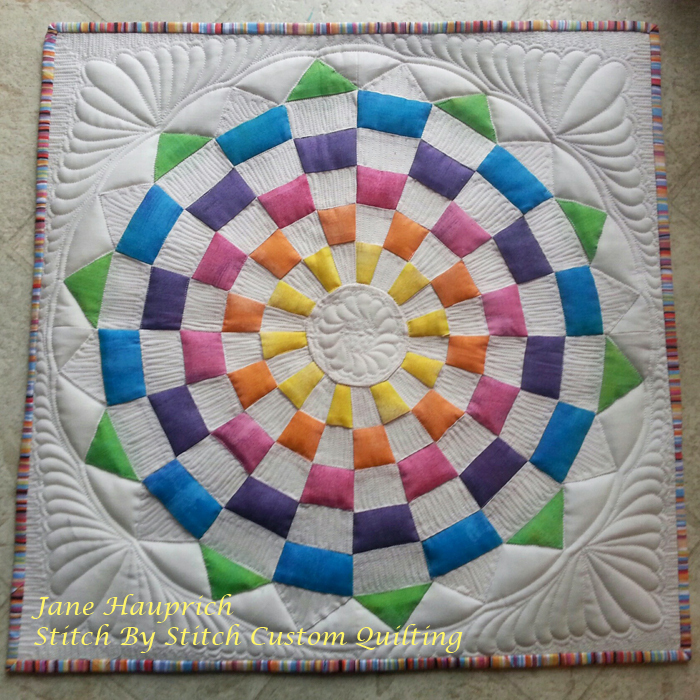 You can find it on Craftsy (to download) or you can order it from me on CD and you get the same files. Snow Crystals is the cover quilt and is based on a vintage pattern of the same name. I converted the pattern from odd shaped templates and set-in seams to simple paper piecing. 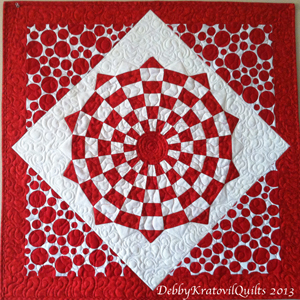 The entire CENTER of this quilt is ONE block: Snow Crystals. It was designed by Eveline Foland and appeared in the Kansas City Star on December 13, 1930! 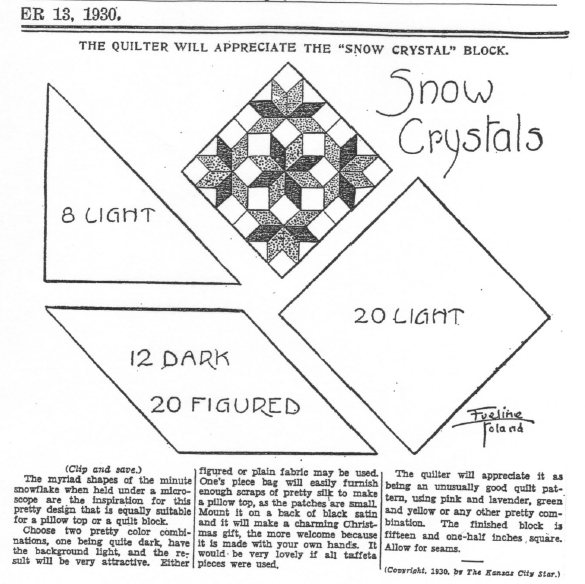 Snow Crystals. Block Size: 24" x 24". 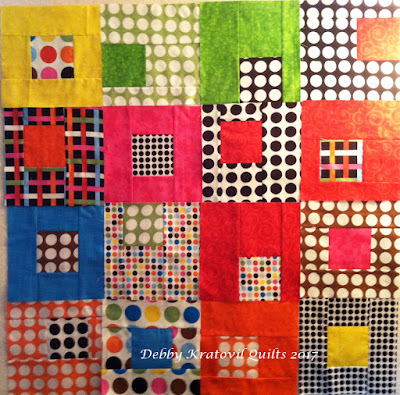 Quilt Size: 34" x 34"
Stay tuned for the other 12 quilts. I know you'll enjoy seeing each of them. These fat quarters just arrived today, the day the Solar Eclipse is happening here in the USA. 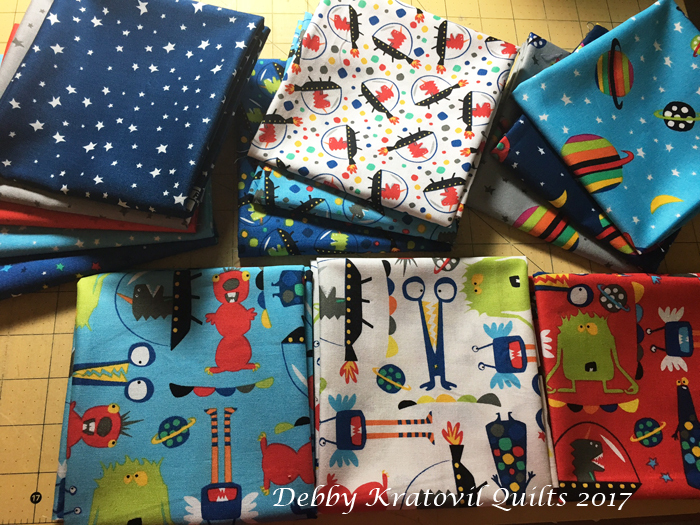 I just had to take a picture of these fun fabrics and share. 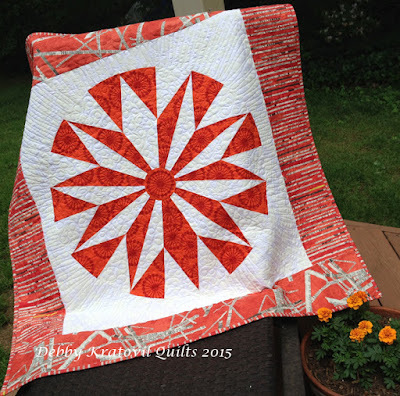 The pattern I designed is still not available at the Windham site, but it's soon coming! Remember the pattern I showed last week? 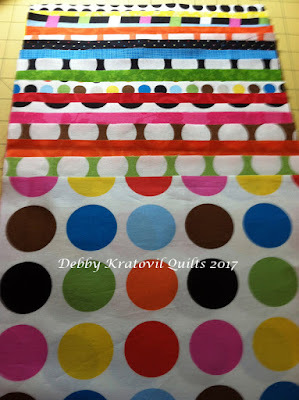 I hope to make some simple blocks with this set of fat quarters. 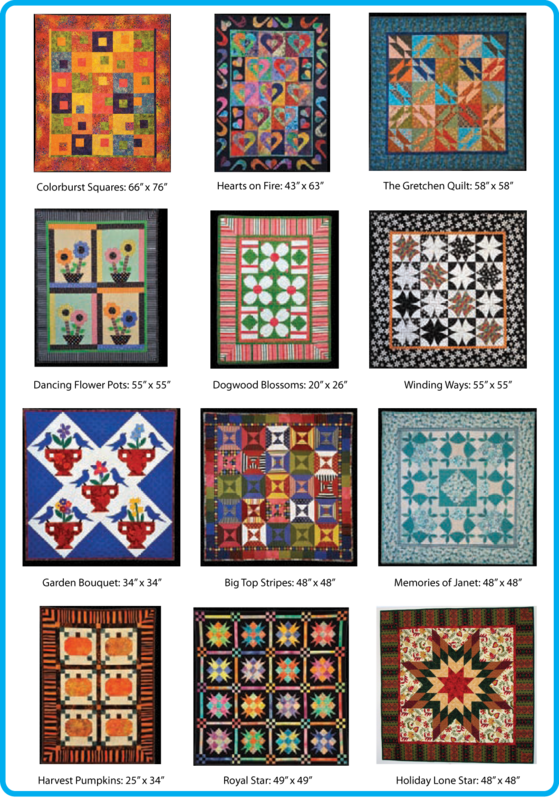 They will make great kids' quilts. 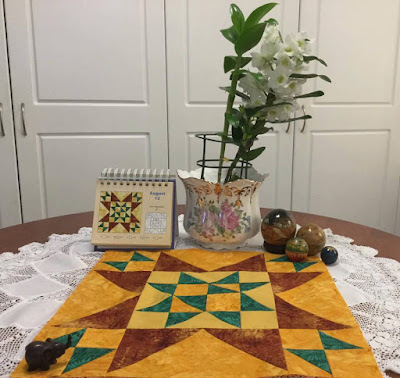 I'm taking these with me to a quilting group that meets at my church. They make charity quilts and are always on the lookout for such fun novelty prints. Take care of your eyeballs today. I couldn't find a pair of those special sunglasses at the stores I visited, so I'm watching everything online at the NASA site. They should get it right, right? Week 34. What else can I say? Let's see what Patricia did with my patterns! 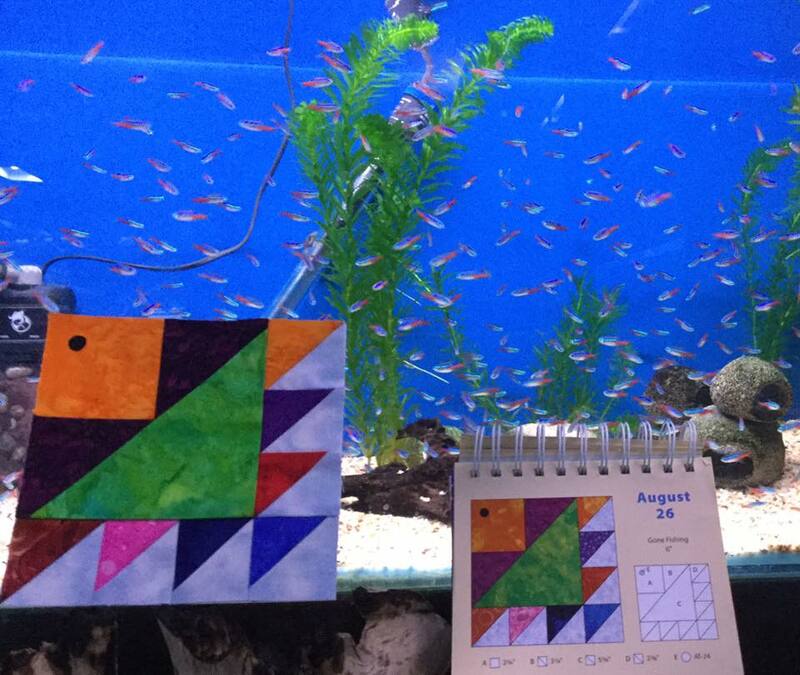 August 24: Tall Ships, 6"
August 26: Gone Fishing, 6"
Thanks for stopping by! Hope to see you next week with 7 more blocks. Are you ready? I won't be in the direct path, but I'm going to buy a pair of those funky sunglasses so I don't burn my eyeballs out. 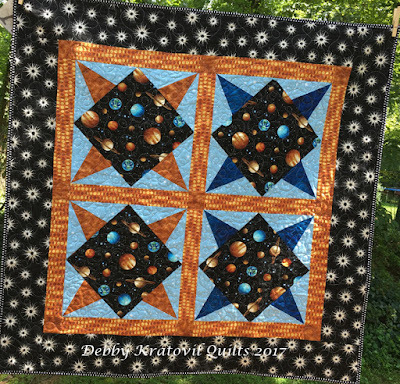 Thinking about this event on August 21 made me realize that I have quite a few celestial quilts, four (yes 4) have the same name: Blast Off! What's with that? Can I share a few of those with you? 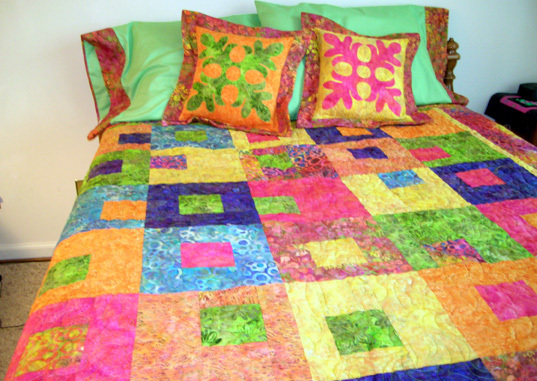 This quilt was made for Benartex Fabrics in 2009, to appear in a Fons and Porter magazine. I'll wait while you check your magazine stacks for this one. 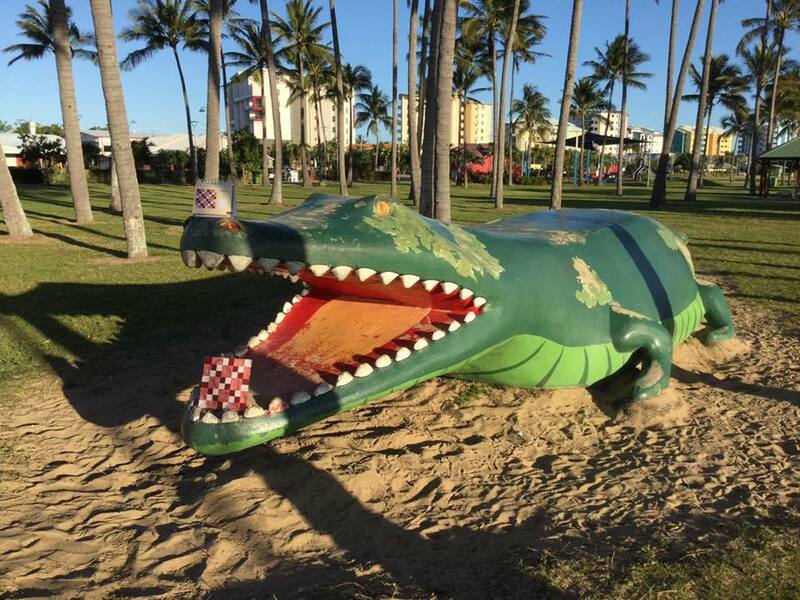 Are you back? Blast Off! 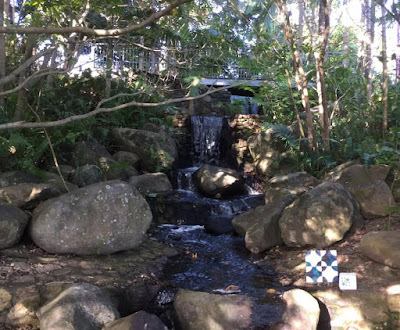 - 66" x 90"
This makes the most of the fabrics as they're centered in those Cobblestone Blocks. 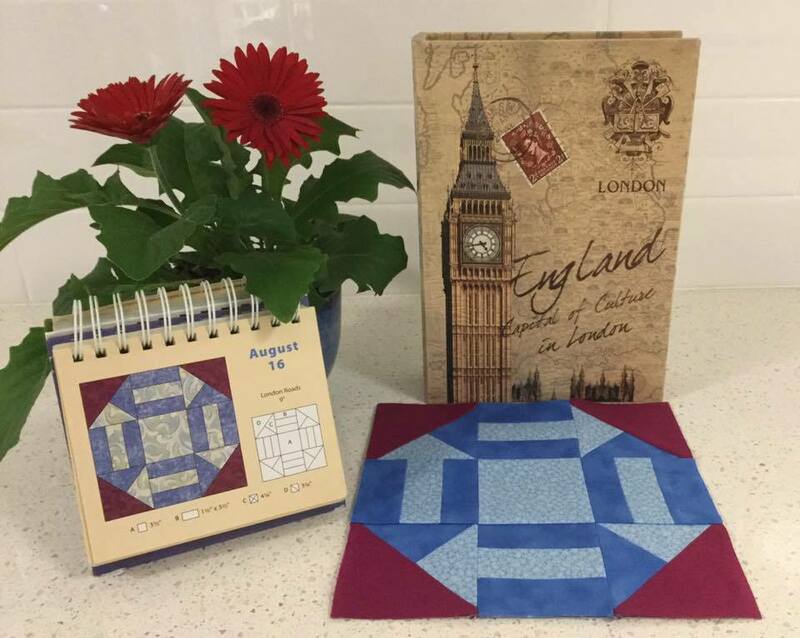 The alternating blocks are a traditional Job's Tears which I converted to paper piecing. 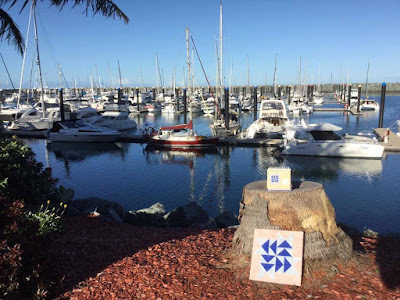 The blocks are 12" x 12". 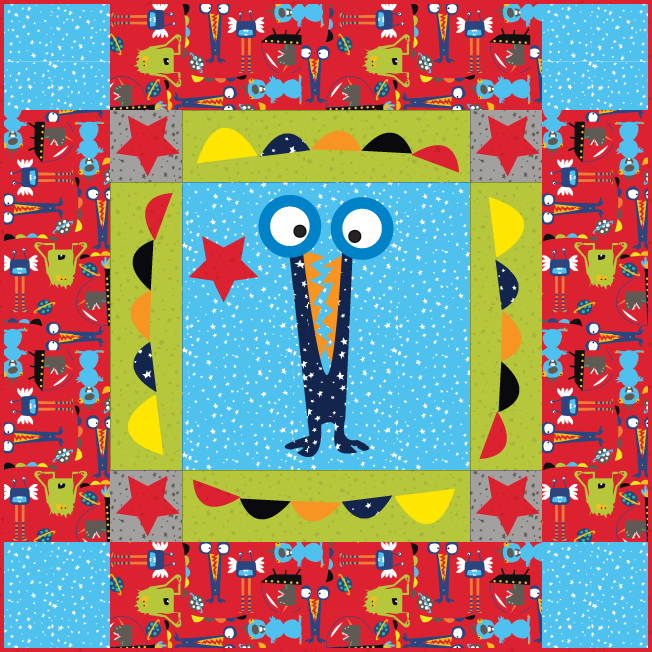 I had fun making this and it's been gifted to some very happy child. 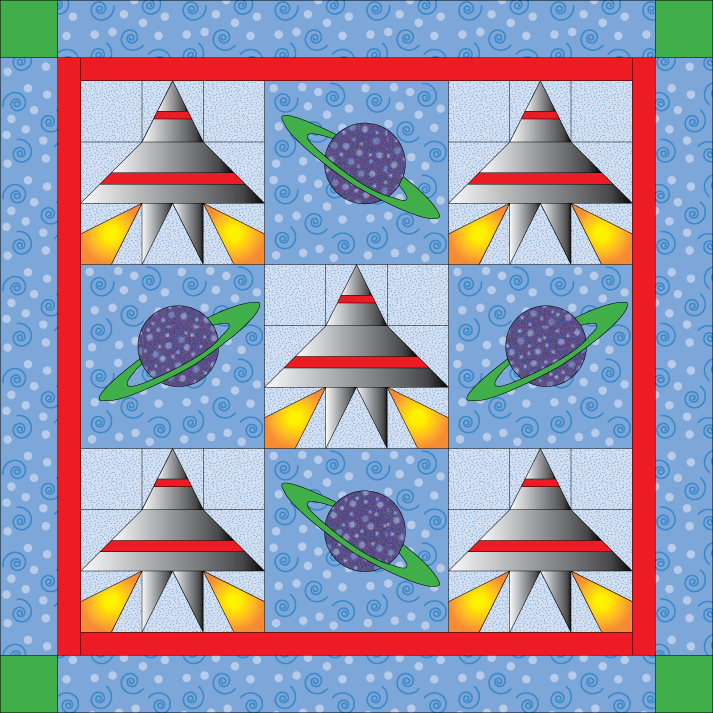 An earlier quilt that appeared in Miniature Quilt Ideas (2005) and also on the cover, I called (wait for it) - Blast Off! 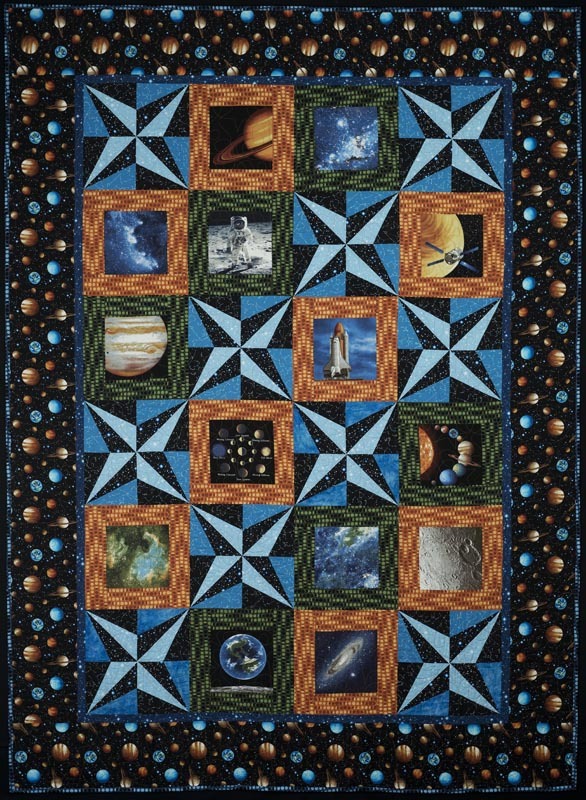 This has 8" Job's Tears blocks and is about 33" x 33". I gave this to my son in law's cousin in Spain in 2007. He loved it! Now, let's see some more. 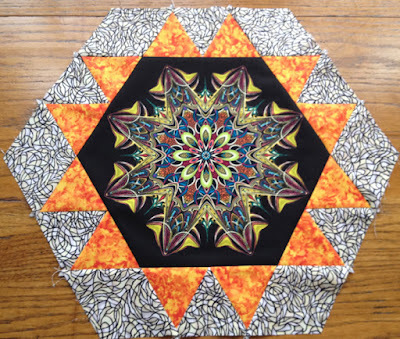 This next quilt is the traditional Diadem block which I converted to paper piecing. The center squares are rotary cut 10" squares and the corners are paper pieced. The block measures 14". 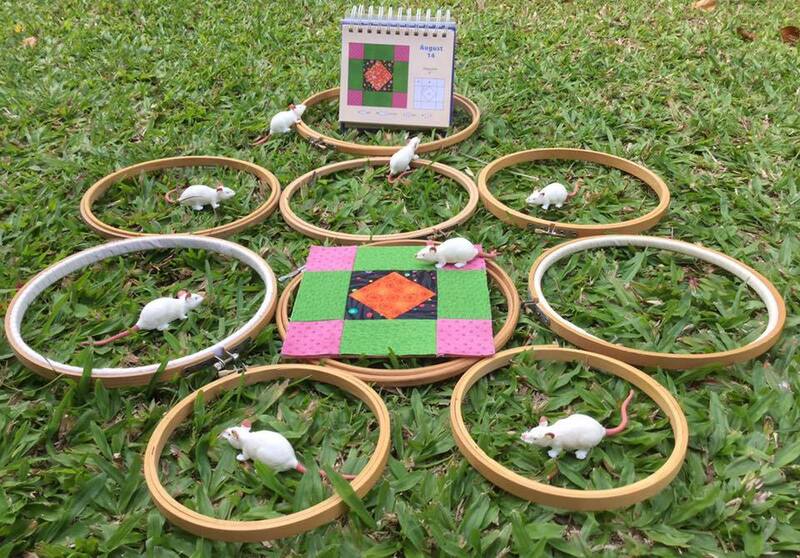 Four of them make an awesome child's quilt. Now that I look at this, I wonder why I didn't alternate those blue and gold blocks!! Duh!! Hey! I thought this was supposed to be about the Solar Eclipse. The sun, right? Last December I posted a happy little block I called the Winter Solstice. That has to do with the sun! I like December 20/21. That's because the days get longer by one minute from then on. 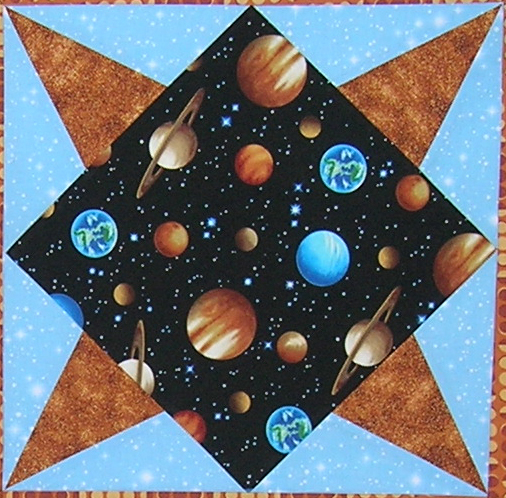 Click the links above and you can see my steps for making this block. I have a FREE solar system themed pattern at the Windham Fabrics web site and - can you believe it - it's not called Blast Off! It uses their current Aliens Collection. I call the quilt My Outer Space Buddy. It uses simple raw edge applique and the pattern includes the full size templates. This pattern hasn't been loaded yet at the Windham site as they are waiting for the fabric to ship to shops. Just hold onto that link, OK? Wherever you are in the path of the solar eclipse, I hope you take precautions with your eyeballs! 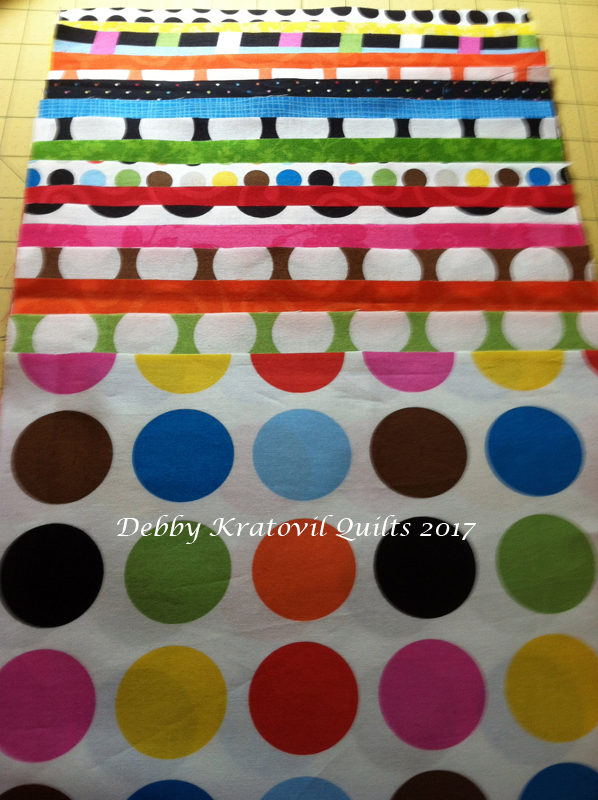 You need them to see your seam allowances, pick out new fabrics and sew your next quilt! 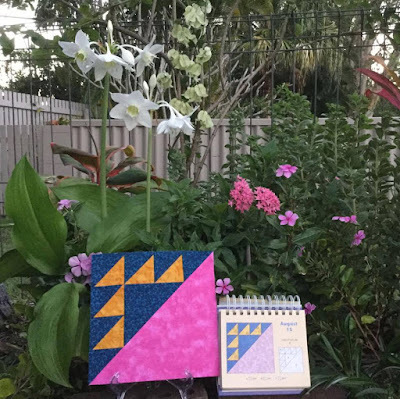 I'm so glad you're still with me as I reveal seven new blocks each week that Patricia Bryant of Australia has made using my Block a Day Calendar. 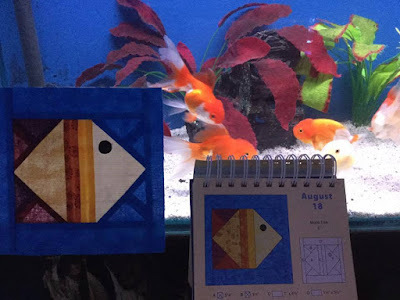 August 13: Grandmother's Dream, 18"
August 15: Lady of the Lake, 8"
August 16: London Roads, 9"
August 17: Mill Wheel, 12"
August 18: Monk Fish, 6"
August 19: Ocean Waves, 12"
This is my 10th year with the Original Sewing and Quilt Expo! 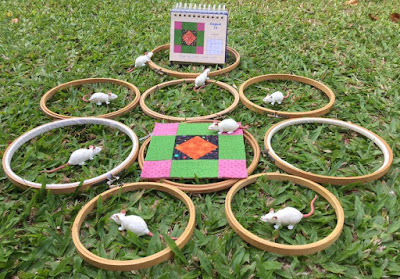 I enjoy teaching with them and creating new classes each year. Here is my lineup for the October 2017 show. Click on the links to get more information and the supply list. 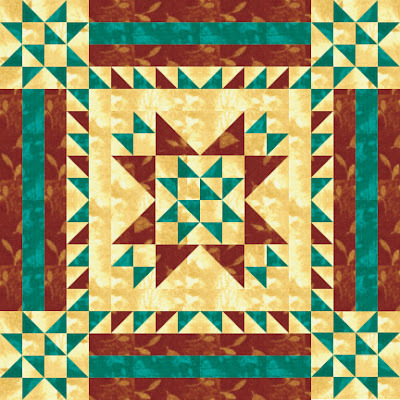 Choose your favorites for this two-color quilt, no paper piecing involved. 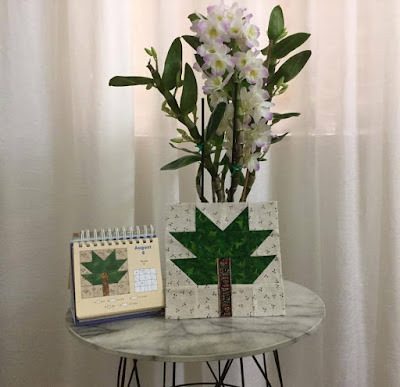 Instead, use a super-sized 18-degree ruler (Dresden Plate shape), 12-1/2” tall and with 60 degree cutting angles (ruler included in the kit fee). 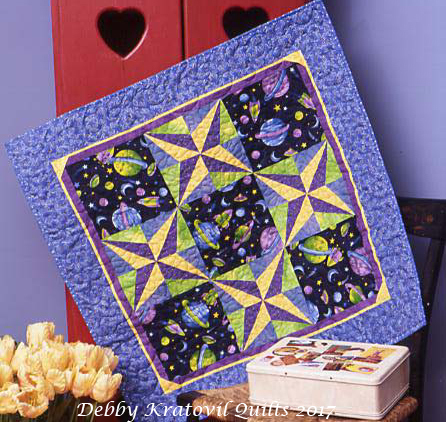 And...Debby's unique cutting and piecing process leaves NO fabric waste. 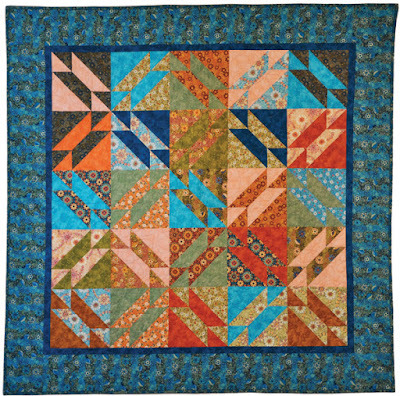 Nor worries about curved edges either, as you experience machine applique with a simple machine zigzag stitch. Easy, and satisfyingly dramatic. 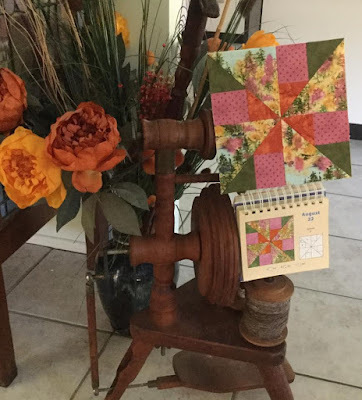 Bring your own fabric; see supply list for details. 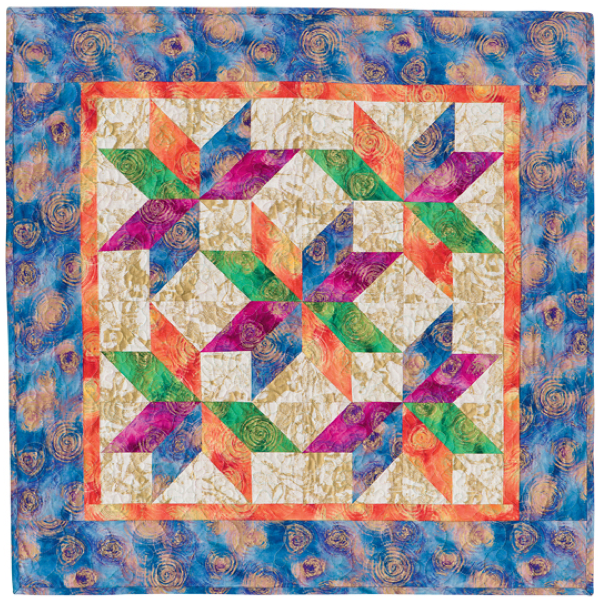 Traditionally sewn by hand, this vintage block can be created entirely by machine, too. 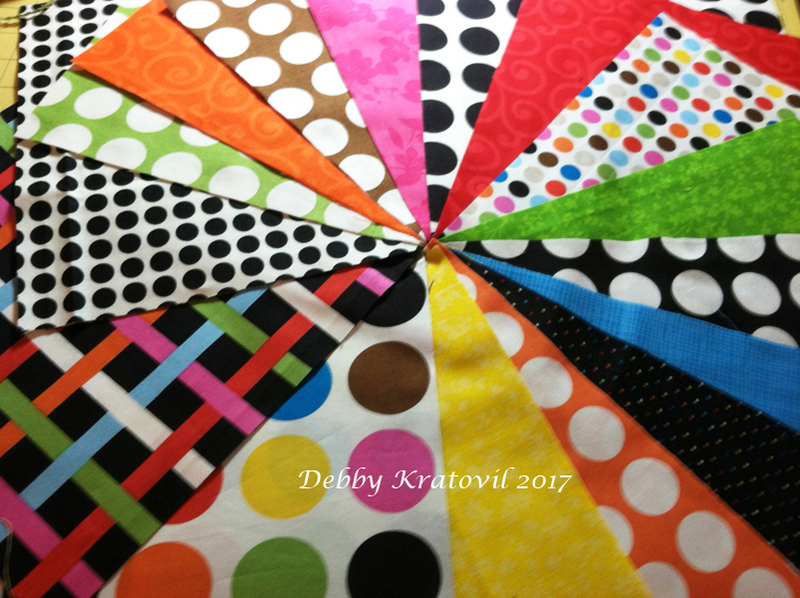 Using quick rotary cut kite shapes, learn how easy it is to sew three together using a simple (and doable) y-seam. 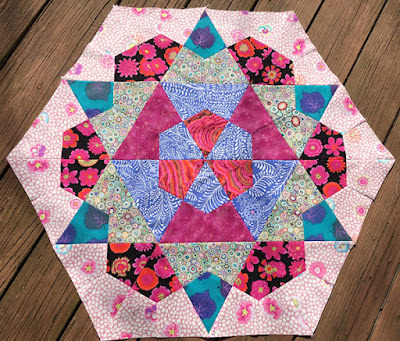 Twenty-four units are then stitched into the Rose Star Block with ONLY straight seams. The supply list comes with a coloring chart so you can plan your fabrics before you finalize them…. and you can make it in a variety of sizes. Make one, and it’s a large table topper. Make several and you have the beginnings of an amazing full-sized quilt. Debby will discuss how to “square up” the blocks to work them into a larger quilt, and discuss adding borders to the hexagon shape (to make it larger). Finished size of ‘one’ is 30 x 34 inches. Bring your own fabric; see supply list for details. Using Debby's KISS Method (Keep It Small & Simple), discover how liberating free-motion machine quilting can be. Discuss appropriate threads, various batting choices and basting your layers, then use your time for lots of PRACTICE. 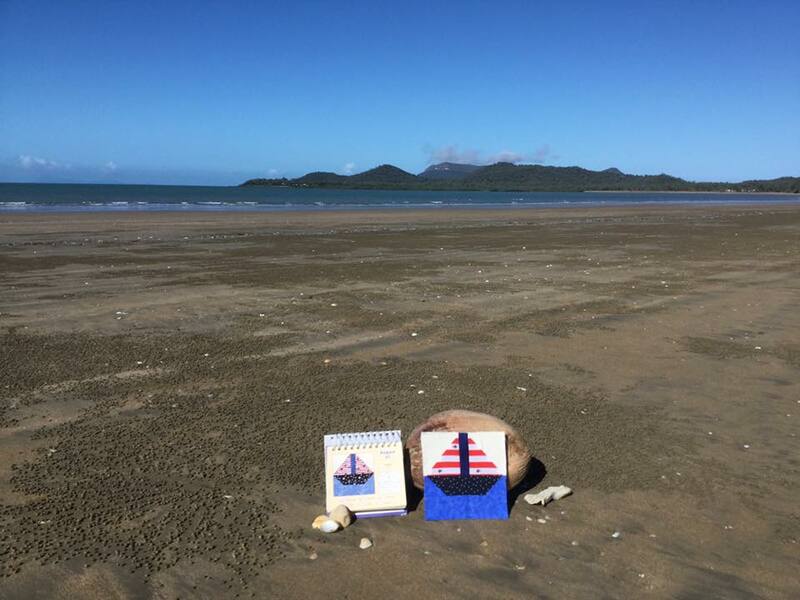 Play with doodles, swirls, curves and other simple shapes, as you are coached and gently guided into this exciting world. 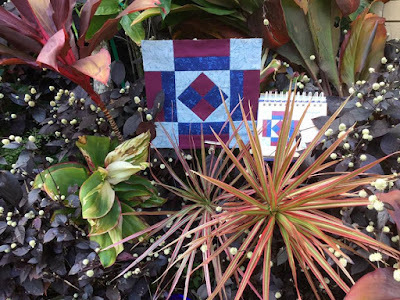 A perennial favorite at the Expo, this workshop is perfect for both beginning and intermediate level free-motion quilters. It’s hard to believe this traditional block, Gretchen, can be sewn without a single template. Everything is cut from two sizes of simple squares; the magic arrives with a quick rotary cutting trick. 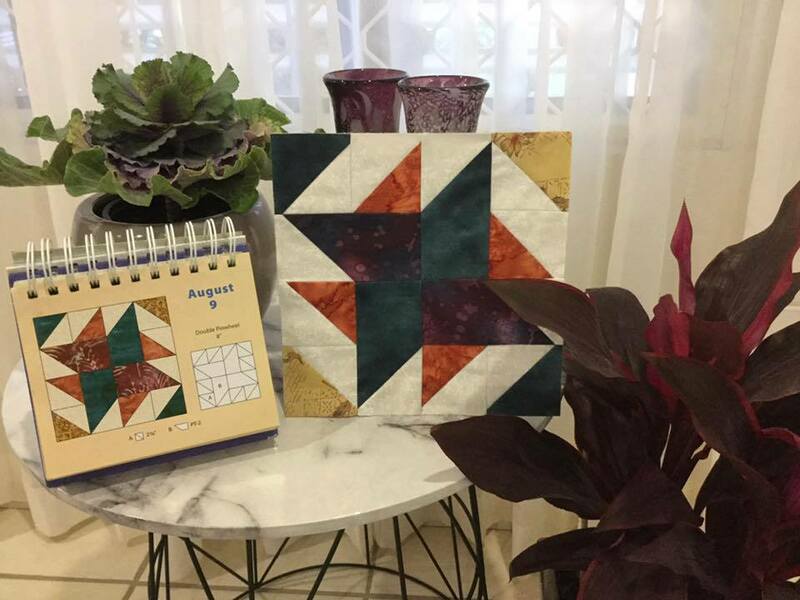 Debby chose a bright collection of florals and deep hued blenders for this quilt, but you can choose any of your own colors with good contrast to show off the lines of the block. As always, Debby’s classes provide all the hints and helpful tips that make them so much better than a simple pattern or kit. And they’re fun, too! Bring your own fabric; see supply list for details. 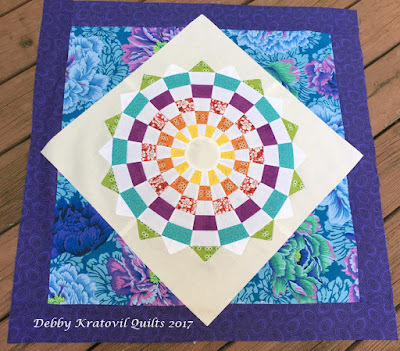 Work with pre-cut strips to create this amazing two-color quilt using a simple acrylic template. Choose ANY COLOR! You’ll strip piece, then cut into wedges and stitch some more. If you’ve wanted to know how to set ANY block on point, this is the class, with the bonus of using two-color setting triangles. 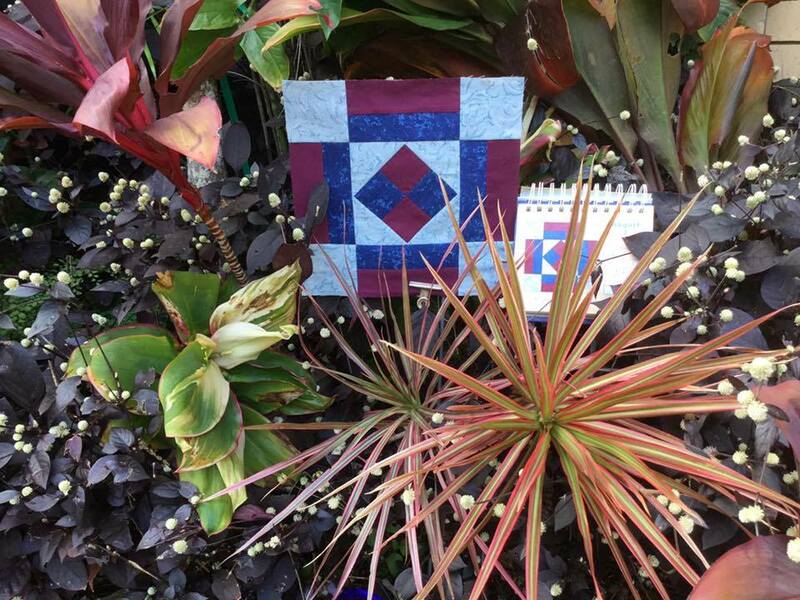 A true optical illusion quilt! Bring your own fabric, see supply list info for details. 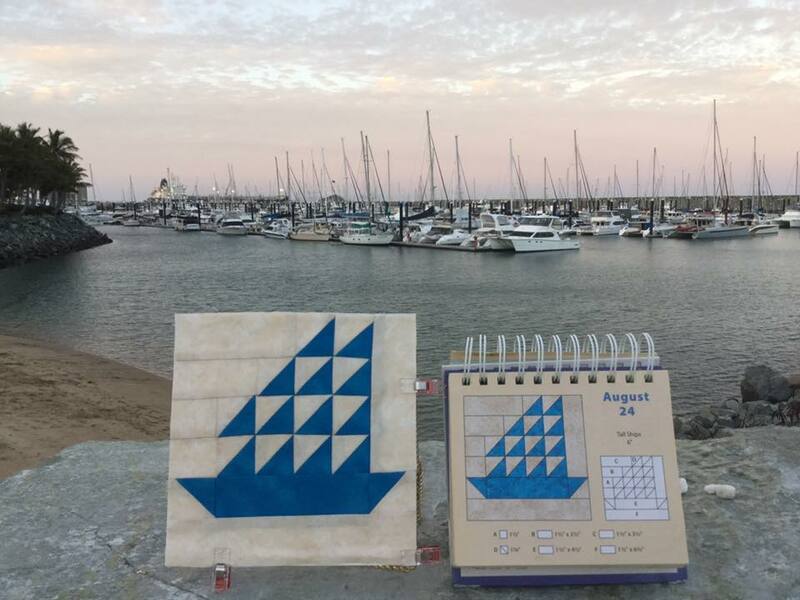 Already the second week in August! Can you believe it? 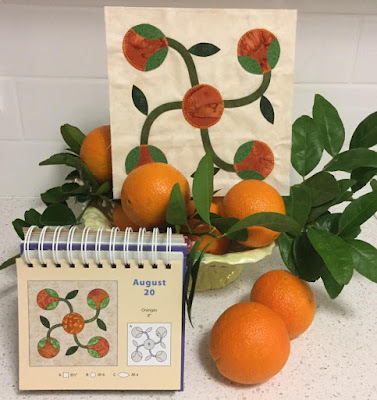 Just a little housekeeping first: my winner in last week's Christmas in July with the Nordic Holiday fabrics is Janie M. of Browning, Illinois. Congratulations, Janie! And many thanks to all of you for your comments about this beautiful collection. And isn't that a fabulous Lone Star pattern? 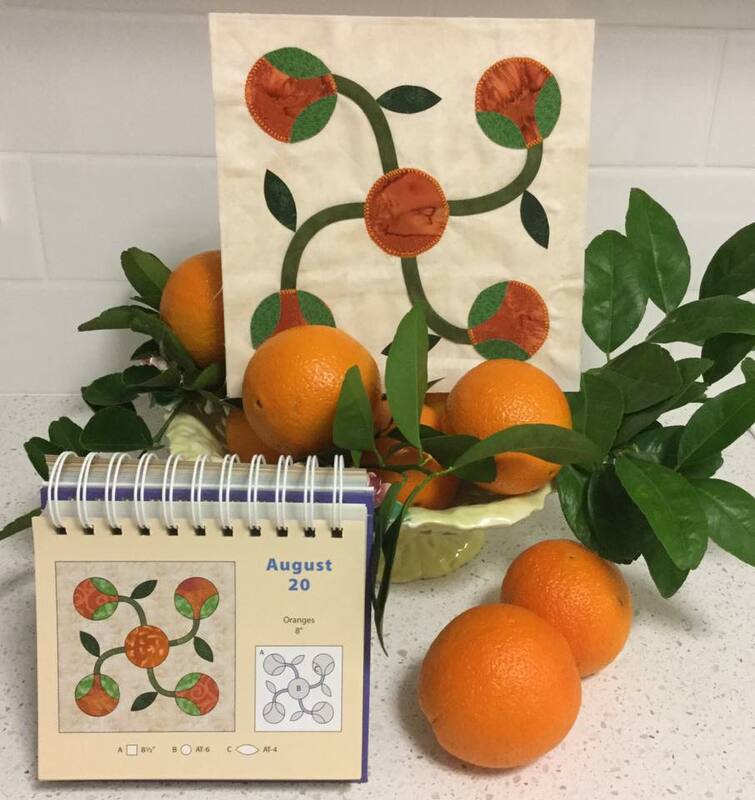 August 6: Tea Leaf, 8"
August 7: Coxey's Camp, 10"
August 8: Diagonal Paths, 8"
August 9: Double Pinwheel, 8"
August 10: Farmer's Daughter, 10"
August 11: Flying Dutchman, 12"
And if you own a copy of the calendar, here's a FREE pattern for this quilt made using the Free Trade Block. I featured this in my Calendar Girls' Quilt Shop Only program in 2008. 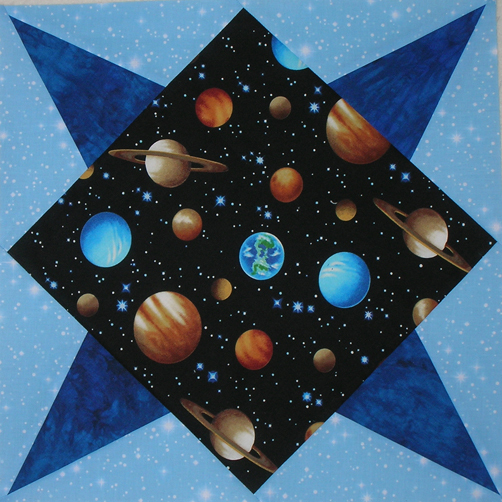 Free Trade Stars Quilt: 36" x 36"
Hope you enjoyed the show. See you next week!